Dr. David Mahon (University of Glasgow), together with Professor Ralf Kaiser, Professor David Ireland, Dr Craig Shearer and Professor Raffaello D’Alessandro, helped to organise the Royal Society Theo Murphy international meeting on the subject of Cosmic-ray Muography in the U.K. from May 14-15, 2018 which included lectures on the topic of recent worldwide industry and academic cooperative muography projects. 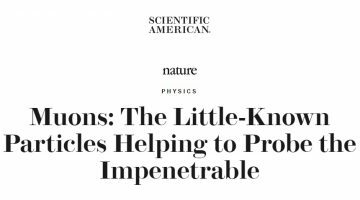 On January 2019, a volume of the Royal Society publication “Philosophical Transactions of the Royal Society A: Mathematical, Physical and Engineering Sciences” was published on this Cosmic-ray Muography scientific meeting and featured a paper on Dr. David Mahon’s research. Currently, Dr. Mahon is a STFC Innovation Fellow at the University of Glasgow, and in 2017 his research was sponsored by a Royal Society of Edinburgh Enterprise Fellowship. He is also Director of the Scottish company called Lynkeos which was funded by a £4.8 million R&D programme provided by Sellafield Ltd. on behalf of the UK Nuclear Decommissioning Authority and is a spin off company from the Nuclear Physics group of the University of Glasgow. 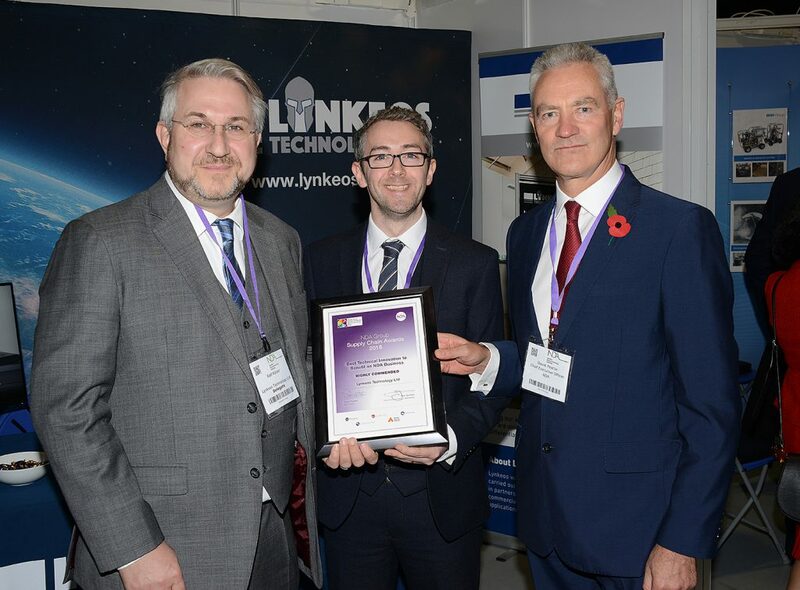 Lynkeos has been given several awards since its foundation including: “Best Business Collaboration” KE Award, the Rushlight Award, IOP Buisness Start-Up Award, the Falkirk Herald Business Award, and their work was also recognised as “Highly Commended” by the U.K. Nuclear Decommissioning Authority in the Best Technical Innovation category. In this interview, he discussed the Muon Imaging System developed jointly by the University of Glasgow and Lynkeos and outlined plans for future development of this muography project called the “Muon Imaging System”, which has been recently delivered to the Sellafield nuclear site where it is currently performing waste characterisation measurements. (Left to Right) Managing Director Prof. Ralf Kaiser, Dr. David Mahon and the CEO of the UK Nuclear Decommissioning Authority David Peattie after being given a “Highly Commeded” rating in the Best Technical Innovation category of the U.K. Nuclear Decommishing Authority. 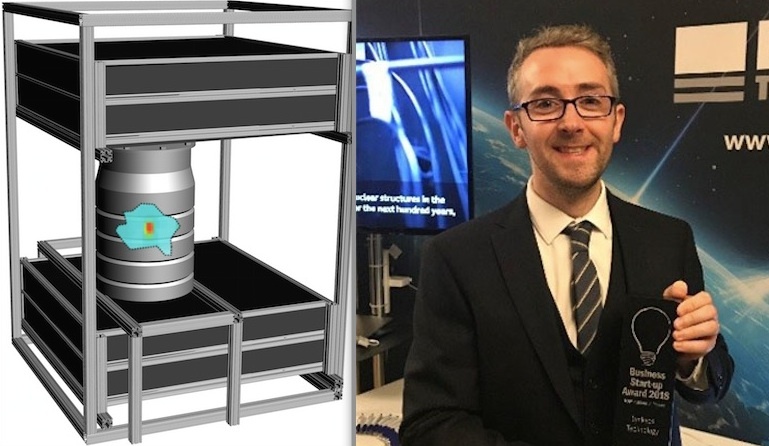 Q: With the present Muon Imaging System (MIS) that you have developed, what is the maximum size of the nuclear waste storage drums that you can inspect using muography? What are some future modifications that are planned to increase the capabilities of the MIS? Q: Now that this project to create the first muon imaging system for the U.K. nuclear site Sellafield been completed and delivered how will this system be applied? 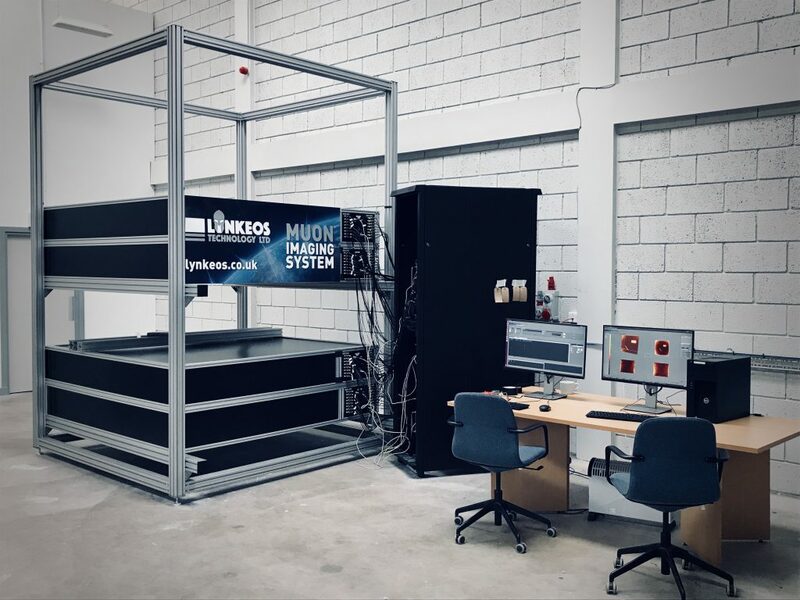 Photo: The Muon Imaging System (MIS) in the lab prior to delivery to the Sellafield site. Q: What is the process and what have been the largest challenges involved in developing this muography technique so it can be integrated into a commercial system? Q: Do you think in the future, muography detectors can be built to be incorporated into nuclear storage facilities? What would be the biggest challenges you would need to overcome in oder to do this? Q: Do you have plans to expand this technique for nuclear storage monitoring in other countries? Q: How has the process of developing this muography technique with the industrial company cooperation of Lynkeos been different from your experience working on projects that are done in a purely academic environment? Q: What are some strategies you have been using to engage with the public and inform them about your research activities?